From the moment tiny baby piranhas hatch from their microscopic eggs, they come into the world armed and dangerous. Baby piranha will feast on tiny crustaceans, fruits, seeds, and aquatic plants. Once they reach about 1.5 inches in length they begin feeding on the fins and flesh of other fish that wander too closely. As they grow larger they begin to venture out in groups (shoals) of about 20 fish where they use a variety of hunting strategies to kill and eat their prey. Heck, they don't kill their prey first, they just start eating the victim alive - that's what makes them so ferocious. Adult piranha have been known to eat their own babies. Talk about brutal! When a school of piranha are in a feeding frenzy the water appears to boil and churn red with blood. They attack with such ferocity that they strip an animal of its flesh within a matter of minutes, even taking bites out of each other in the process. There are approximately 20 species of piranha found living in the Amazon River, with only four or five of them posing any danger. Most piranha species are quite harmless and docile, but the ones with the nasty reputation for aggressive behavior are the red-bellied piranha, Pygocentrus nattereri. A sick and dying cow had been taken down and finished off by a school of ravenous piranha during the dry season when they are notoriously aggressive. 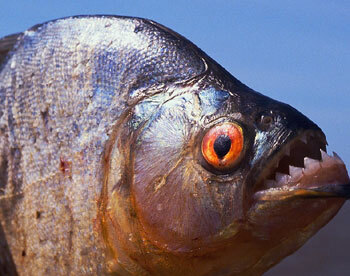 Adult piranha will eat just about anything - other fish, sick and weakened cattle, even parts of people. Sickly cattle that have stooped their heads down to drink from the river have been grabbed by the mouth and nose and pulled into the water, completely devoured minutes later. As wicked as it all sounds, piranha have a useful function in the Amazonian jungles just like any other predators in the wild. They are part of the checks and balances Mother Nature employs to eliminate the weak and sick so only the strong survive. Piranhas are world-famous for their razor-sharp teeth. Native peoples of South America will catch the piranha and use their teeth to make tools and weapons. Even the fisherman who catch these vicious little predators have to be careful when the fish is out of water. A single piranha out of water is still dangerous enough to take off the flesh, or the odd toe, from an unwary fisherman. As ferocious and fearsome as the piranhas are, they are not invulnerable. As young the piranhas are a tasty part of many other creatures' diet. As voracious adults the piranha feed on young herons that fall from the trees while learning to fly, or young caimans (a type of small alligator) that are too little to defend themselves. When the floodplains of the Amazon run dry during the dry season the piranha are stranded in isolated lagoons, where they languish and die from lack of oxygen. The adult herons will then feed on the piranha that once ate their young. Caimans will feast on the piranhas that ate their young kin, as they lay dying in their shrinking pools. Such is the circle of life. Believe it or not, there are people who actually keep piranhas as "pets". Piranhas aren't good pets in the traditional sense because you can't hold or pet them, and they aren't affectionate. Piranha owners still must be extremely careful of the fish's sharp teeth and aggressive nature. Keeping them well fed is probably the key to keeping them mellow. People who fancy piranhas as pets may be more attracted to the grisly reputation and aggressive manner of these world-class predators, perhaps keeping them for their "entertainment" value. That's O.K. - it's human nature to be fascinated with morbid and gruesome creatures. But piranhas are also very beautiful fish. As long as anyone desires to take a creature out of the wild and bring into captivity they must take the responsibility of treating it with respect and good care.